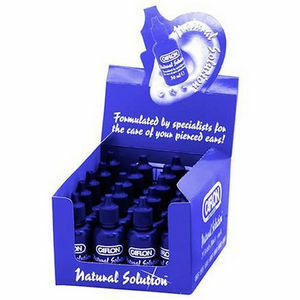 Display box full of 20 bottles of Caflon's Natural Solution. Caflon's Natural Solution makes up an essential and hygienic part of Caflon's own piercing systems. As a part of the after care regime, Natural Solution should be used to cleanse the back and front of the piercing site on the ear. This should be carried out before rotating studs and again after shampooing hair. Between the times where this cleansing occurs, the piercing area should be kept dry. It's the best cleansing product on the market for pierced ears, from the manufacturer of the most widely recognized ear piercing systems in the world. Comes in a display box of 20 x 30-ml bottles. £13.50 (inc. VAT) Why no VAT? We're a trade wholesaler and quote our prices without VAT to help our VAT-registered customers understand the true cost of a purchase.